Stems: Erect, slender, branched above, long-hairy or nearly glabrous. Leaves: Alternate, simple, short-stalked below, heart-shaped clasping above, broadly to narrowly oblanceolate, 1 to 6 inches long, 1/4 to 2 inches wide, long-hairy or nearly glabrous; margins bluntly or sharply toothed to nearly entire; tips blunt or pointed. Inflorescences: Heads, open-clustered, numerous, terminal. Flowers: Heads 1/2 to 1 inch wide; bracts narrow, nearly equal, margins broad, translucent to purplish; ray florets 150 or more, fine, thread-like, white, rose-purple or pinkish; disk florets numerous, yellow. Fruits: Achenes, flattened, 2-nerved, sparsely hairy, tipped with circle of 20-30 bristles, enclosing small seed. Habitat: Open, moist sites, low prairies, and stream banks, often where there has been some disturbance. Uses: Some Native American groups used Philadelphia fleabane medicinally to treat colds, diarrhea, and sores. Comments: The common name "fleabane" comes from the old English belief that the plant could kill or repel fleas. This plant can be somewhat weedy. 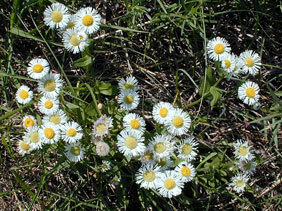 See also annual fleabane (Erigeron annuus) and daisy fleabane (Erigeron strigosus).